Keynote for iPad is the newest and most innovative of the mobile productivity apps for your iPad developed from the ground up by Apple Inc. for the iPad. Use Keynote to develop your won presentations using new graphical templates for stunning slides and brilliant transition effects like Anagram, Page Flip, Mosaic, and Twist. The slide navigator lets you rearrange and organize your slides easily using drag and drop finger gestures. Animations include Magic Move, Flip, and Spin that support multiple gesture movements on the iPad. You can view your presentations using full screen mode directly on your iPad or present to a large audience using an an optional iPad Dock Connector to VGA Adapter that you can buy and connect to any projector system at work. If you’d like you can also export your Keynote files (by email, iTunes File Sharing, or iWord pubic beta) so you can view them on your MAC or PC. As with other mobile productivity apps like Pages and Numbers, you can add media including photos, videos, tables and charts from your existing apps into your Keynote slides. Keynote can open PowerPoint files and can export PDF as need be. 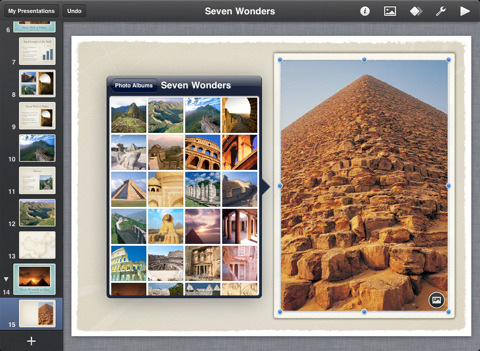 Keynote for iPad sells for $9.99 in the iPad App Store. AppSafari review of Keynote was written by Joe Seifi on April 1st, 2010 and categorized under App Store, Featured, iPad apps, Productivity. Page viewed 4426 times, 1 so far today. Need help on using these apps? Please read the Help Page.